Note: CLI Studios has recently revised its products and services to provide them all through its Studio Partnership Program, where CLI works directly with dance studios. Stay tuned for a new article on CLI’s programs in 2018! It is rare to find a dance company so willing to be about the artist, and not ulterior motives. CLI Studios is about the artist. They’re more about the dancer and teacher learning and continuing to stay inspired, and less about how much money they make at the end of a fiscal year. CLI Studios is about the choreographer, the dancer, the teacher, and the studio owner growing and collaborating to fuel the world of dance through online sharing. This is a business model I can get behind. Co-founders Jon Arpino and Teddy Forance. Photo by Rob Daly and Quinn Wharton. 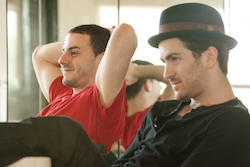 About two years ago, CLI Studios Co-Founders Jon Arpino and Teddy Forance were talking about how Forance and a few other notable choreographer friends receive requests from studios all around the country and world to teach master classes. Time for these renowned choreographers, however, is precious and rare. Also, unless you live in New York or Los Angeles, it is unlikely you have the opportunity to take class from Allison Holker, tWitch, or Caitlin Kinney on a weekly basis. Enter CLI Studios – an online dance class sharing platform that allows members the opportunity to learn from 40 different choreographers at any given time for a low price. Arpino says there are three different programs from which to choose. Some of the choreographers represented at CLI Studios include the aforementioned Teddy Forance, Allison Holker, tWitch, Caitlin Kinney, as well as Kathryn McCormick, Nick Lazzarini, Kenny Wormald, Kyle Robinson and many more. Most of these choreographers travel with conventions, tour as back-up dancers, or perform on shows like So You Think You Can Dance and Dancing with the Stars, staying constantly busy. Teddy Forance and Caitlin Kinney, choreographers for CLI Studios. Photo by Rob Daly and Quinn Wharton. CLI Studios offers multiple styles of dance, including jazz, contemporary, ballet, basic technique, hip hop, salsa and more. “We like to keep it diverse in terms of styles,” Arpino says. 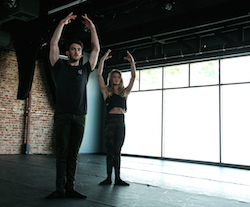 One benefit of CLI Studios for teachers is learning a multitude of dance styles that you may not be as comfortable with, and keeping up with ever-evolving dance trends. Twitch instructing a class for CLI Studios. Photo by Rob Daly and Quinn Wharton. CLI Studios wants to challenge, inspire and continue collaborating with many different artists and choreographers. One of those artistic humans is Wade Robson. 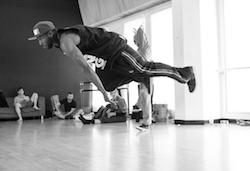 CLI and Robson recently worked together to create a short dance film entitled FLIGHT. Teddy Forance and Jaimie Goodwin. Photo by Rob Daly and Quinn Wharton. FLIGHT, the multitude of choreographers, the low cost and the quality of classes available…all of these aspects of CLI Studios are solid reasons for becoming a member of the online dance studio platform. To become a member of CLI Studios, or to learn more, visit www.clistudios.com. To watch FLIGHT directed by Wade Robson, visit www.clistudios.com/flight. Photo (top): Caitlin Kinney, co-creator and choreographer for CLI Studios. Photo by Rob Daly.